"that's good enough for me... cookies, cookies, cookies start with c"! Well, technically, being vegan, these cookies start with V! Now, how long has it been since I've posted about cookies?! Shocking, as you know cookies are my baking passion. So... let's get nibbling! These are my Jam-Print Cookies from ed&bv. I posted about these before when I was developing the recipe for the book. Of course, these are made wheat-free, using spelt flour. There are crushed walnuts in the recipe, but also an option to use hemp seed nuts instead of the walnuts if you have nut allergies. When I made this batch recently, I simply wasn't in the mood to crush the walnuts. You know those days - you want to get those cookies baked, but with as few steps and mess as possible! So, I opted for the hemp seed option, but used 1/2 hemp seed nuts and 1/2 ground Salba seed. See this post for more info on Salba. Worked like a charm! Though, if you have the gusto to take the extra step, walnuts do add a gorgeous nutty flavor to the cookies. Next out of the oven are Walnut-Carob-Cranberry Clusters from eat, drink & be vegan. Also posted about these before when I was testing the recipe for ed&bv, check out another pic if you like! Now, these are a crunchy cookie. Crunchy with a buttery-sweet flavor (but no butter used obviously, and no margarine). They are chock full of walnuts, and just a touch of flour, which is why they form a clustery-crunchy cookie. When you form these cookies to place on your baking pan, it might seem that they won't hold together. Patience, my pretties. Just get them in purty little clusters on your sheet, rinse/dry your hands once or twice to minimize stickiness, and get all those delicious clusters in the oven. Don't overbake! The walnuts and carob can quickly get too toasty, then border on burned. Avoid that by not overbaking. Of course, both of these cookies are treats you can feel good about eating. Healthier sweeteners, healthier flours... and, I give you healthy nuts and seeds in there too. Yet, they still deliver cookie indulgence. The thumbprint jam cookies look like something my cousins would LOVE--and something healthy enough that I wouldn't mind feeding it to them. Oh no! That song will be stuck in my head now! btw- Christian Finnegan made a comment about vegan cookies being bad on Countdown with Keith Olbermann tonight- I wonder if someone should set him straight! I have all of your cookbooks and i love you make so much delightfull recipes with no wheat! I just made your Super Charge cookies tonight and they were beyond excellent, Dreena. Your cookie recipes always come out perfect! you should put out a book of just vegan cookie recipes, dreena! all the ones we've made from all 3 books have been sooooo good. clearly, it's your calling. Thumbprint cookies remind me of childhood days and going to visit my grandmother's sister. She would always have something yummy for me. I think I will get baking! Thanks to your book, ED&BV, I've been putting hemp in everything (I love your recipes for the hemp burgers and granola), but I would have never thought of cookies! These sound great! I make these cookies about once a week and they disappear quickly... my mom loves them, and so do my sister and her kids. I have to do a double batch so there are enough for my own family! I use the hemp seeds and am going to try adding some salba too -great idea! Carob & cranberry is SUCH a good combo!! Both of those cookies look mighty tasty! 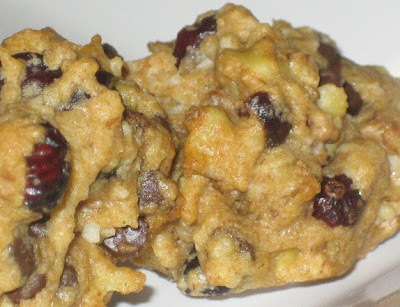 ~Erin @ "Vegan & the City"
As always, your cookies look wonderful and enticing. I need to get your cookbooks. The addition of hemp seeds is a nice change! I've been enjoying hemp seeds lately, and they are so good! You always have the best cookie recipes, and those jam ones are calling my name! Btw, I made the cornmeal raspberry pancakes this morning with celestial cream. You were right - that stuff is amazing! I made these Jam Print cookies yesterday afternoon... today there are none left... nothing more needs to be said!! Thank you, Dreena, for every single recipe in your books. I love them all!!! Thanks for your post. Eating walnuts after a meal high in unhealthy fats can reduce the damaging effects of such fats on blood vessels.